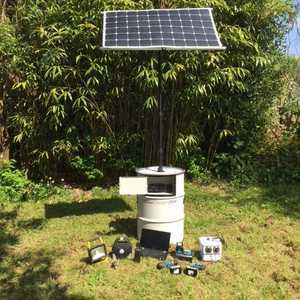 A standalone, modular and highly portable Solar Charging Station to provide sustainable silent off grid power for Glamping, Disaster Relief, Camps, Mobile Clinics, NGOs and rural Communities. Will power Phones, Tablets, Medical equipment, WiFi, CCTV & Lighting. 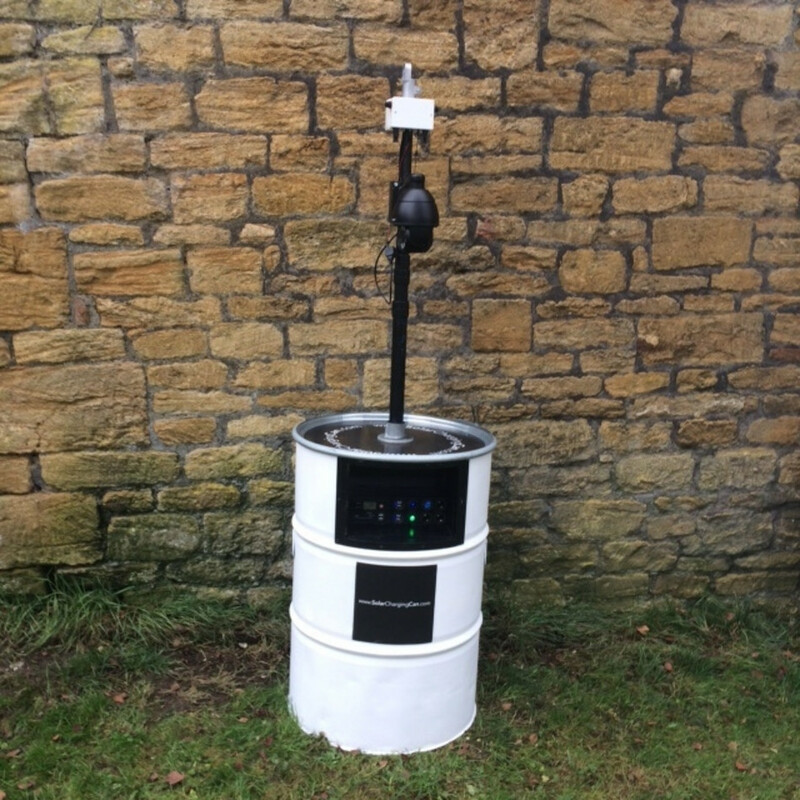 Patent pending, designed & manufactured in the UK. 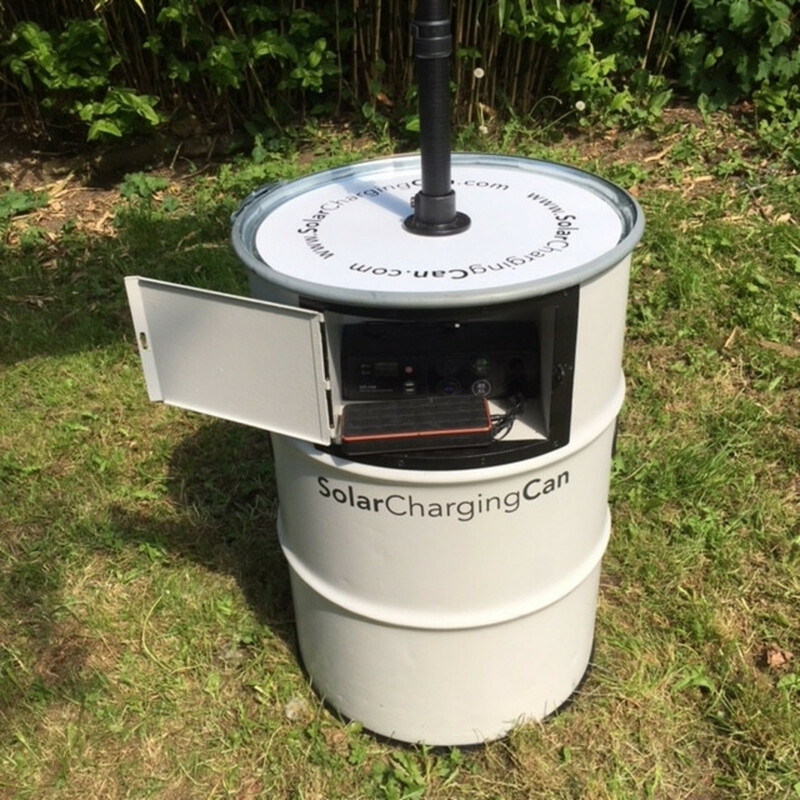 The Solar Charging Can is a patent pending off-grid Solar Charging Station to supply 'Green' sustainable 5v-12v charging, Lighting, CCTV and WiFi all stored and transported within the Drum. Highly Portable, Modular and easy to store, provides maintenance-free silent power where ever it is deployed. 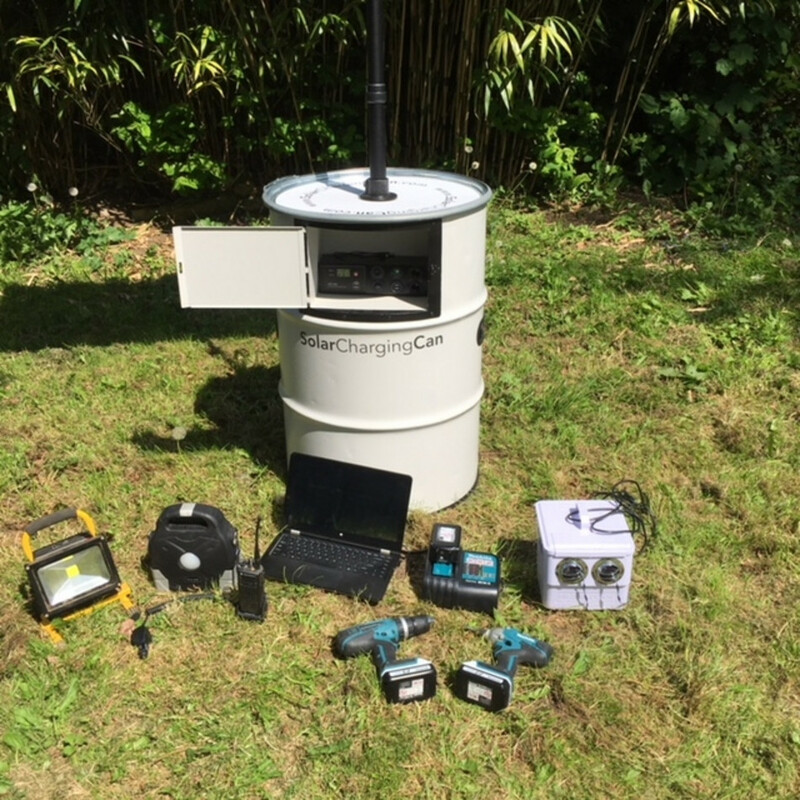 Primarily designed for Disaster Relief, Refugee Camps & Mobile Clinics, where ease & speed of deployment, lack of maintenance and robustness are a priority. 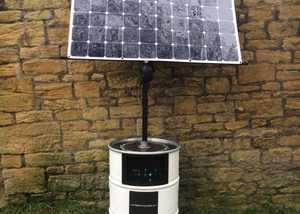 It is also a suitable alternative power generator to expensive & noisy hired generators at Events & Festivals & Glamping, to provide power, WIFi, CCTV, Lighting. There are two versions of the Solar Charging Can, one with detachable steel poles and couplings and a lightweight version with telescopic Aluminium fittings and fixtures, upgraded Solar Panel and greater Battery storage. 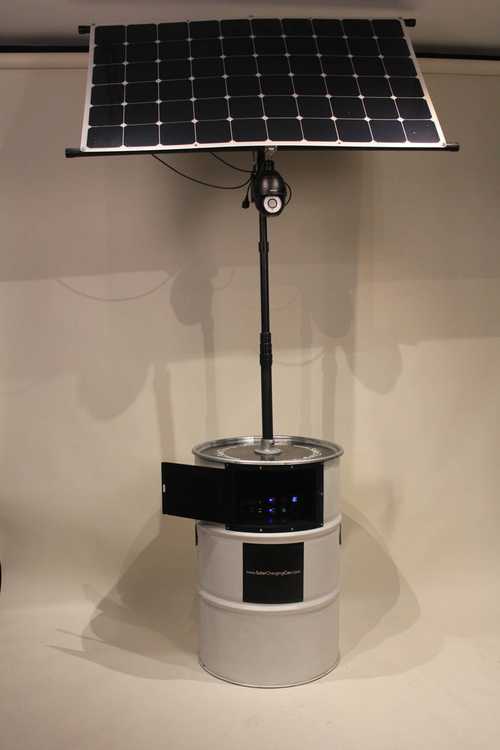 Optional accessories include CCTV, WiFi, LED Floodlights, inverter, removable Li-Po super Power Banks (up to 300Ah) & additional Solar panel. 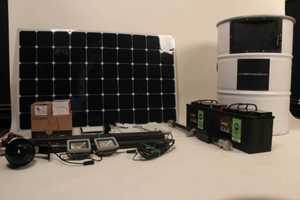 The multiple power outlets are also able to run Portable Ultra-Sound, Thermal Imaging Cameras, Satelite Communications & evaporative air coolers. 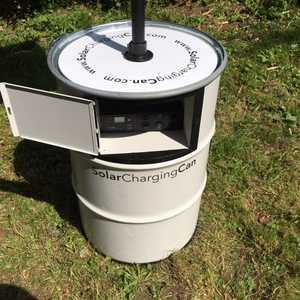 Since each Solar Charging Station is pre-wired with quick-fit waterproof connectors, all components secured within, it can be assembled for deployment or disassembled for storage or movement in 30 minutes. 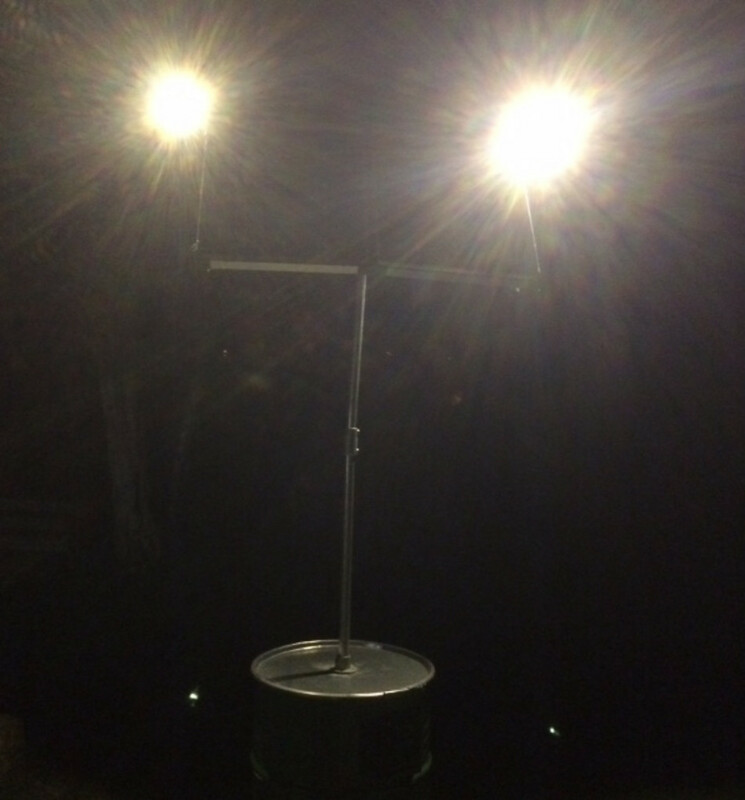 Suitable for either long-term static positioning or easy movement & rapid deployment elsewhere. 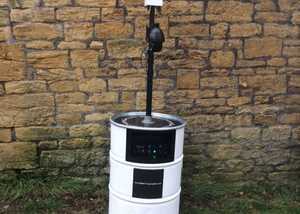 Since each Solar Charging Can is made to order, it is possible to adapt to specific requirements, i.e. 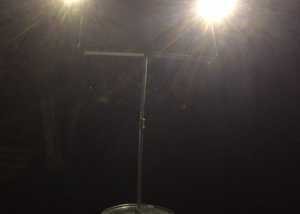 Variations in LEDs, CCTV, WiFi requirements, auxiliary charging of other devices. 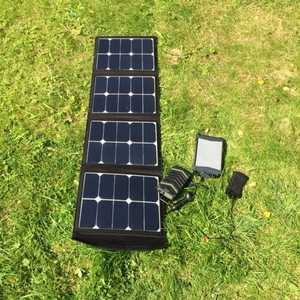 Mobile Solar Chargers have specialised in fit for purpose portable power for over 6 years, our products have been across the Atlantic, Arctic, Antarctic, Kilimanjaro and Everest base, if you have a particular project give us a call. We have Li-ion portable power banks up to 110Ah with variable voltage from 5v-240v, rechargeable from our solar. 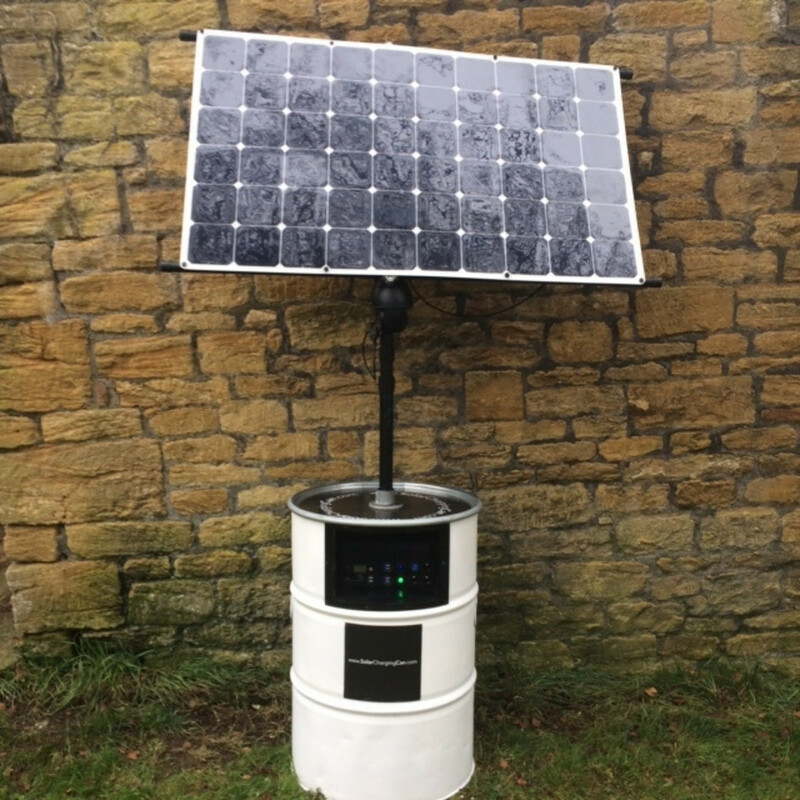 This unique off-grid Solar Charging drum has been designed and manufactured by Mike Parker and Tim Smerdon at Mobile Solar Chargers Ltd. Silent, automatic lighting, phone charging, remote CCTV Camera, WiFi, portable, modular, easy to store, low maintenance. 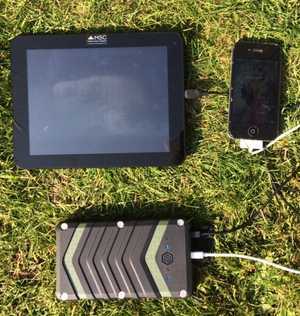 A variety of Expedition proven Power Banks ranging from 26000mAh to 113000mAh and other accessories are available at www.mobilesolarchargers.co.uk .